In the slow process of converting our house from brass accents to brushed nickel & chrome, I finally decided to tackle the master bathroom tub. 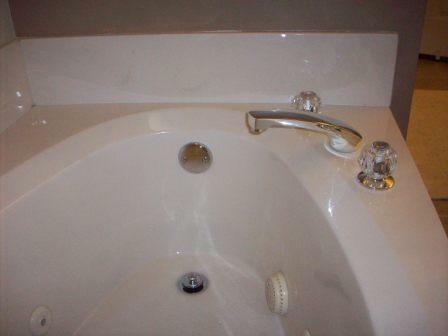 To replace the Roman Tub faucet with the same base faucet from Moen, would have cost at least $270. On top of that, the older Moen faucets are not typically compatible with the newer models, requiring the replacement of the valve kit. This would involve so demo work on the tub, added substantially to the cost. So, how did I get around this problem? I did what every great American does. I got it chromed! 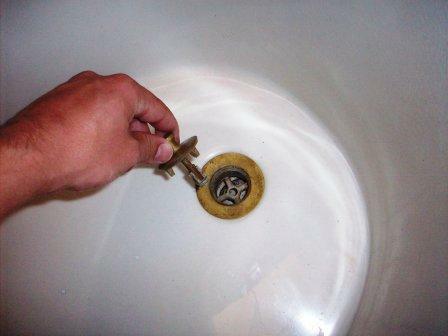 To remove the faucet, I followed the installation instructions in reverse that I found on the Moen website. 1. 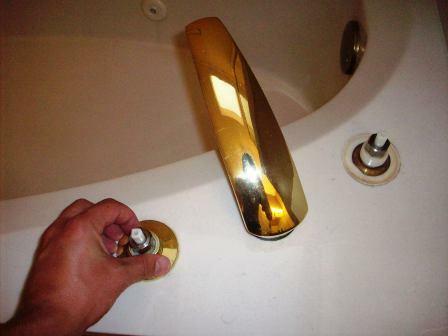 The hot and cold water knobs were removed and the brass accent rings below them were unscrewed and removed. 2. 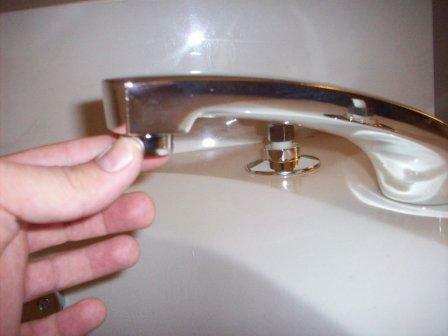 The set-screw on the back side of the faucet was removed, and the faucet was carefully pulled up. 3. Now, send your components to a local chrome shop. In Texas, and around the country, the EPA has cracked down on chrome companies due to the harmful chemicals used in the process. Therefore, I found a place in Dallas that used the Cosmichrome water-based spray on chrome process. It was performed at Elite Plating. They just started using this process and chroming parts for the public, so, they haven’t perfected the process yet. As with any spray on coating, dust is an issue… But, for my purpose, the finished product looks great. They charged $85 for the coating. 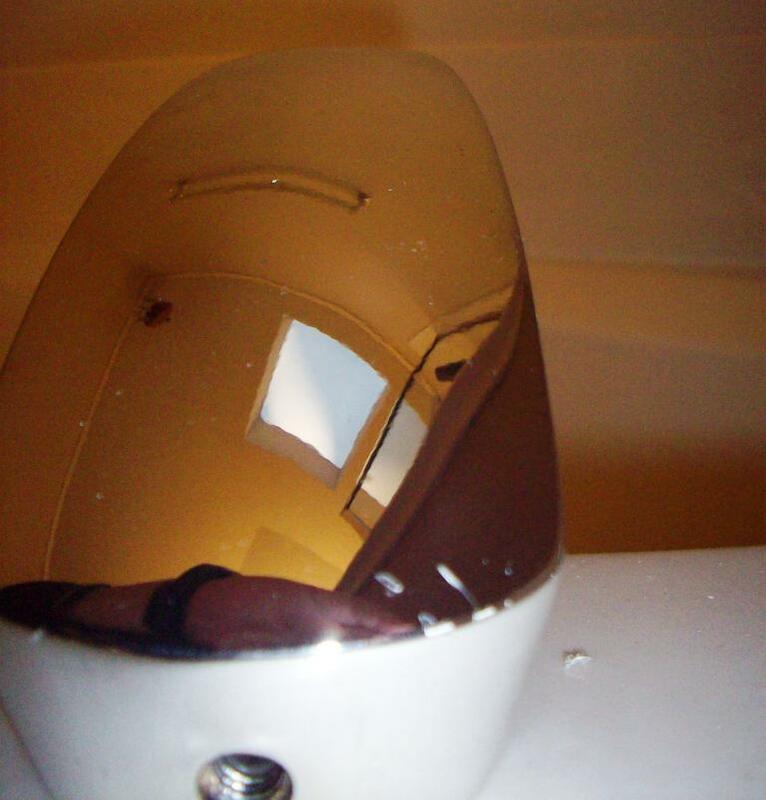 I received a quote from a real chrome plating company, Superior Chrome Plating, in Houston. They said they could do it for around $85 to $100. Note: Most of the cost to chrome anything is labor charges. You can reduce the amount of labor required by sanding away any rust or loose brass plating and polishing the item yourself. 4. 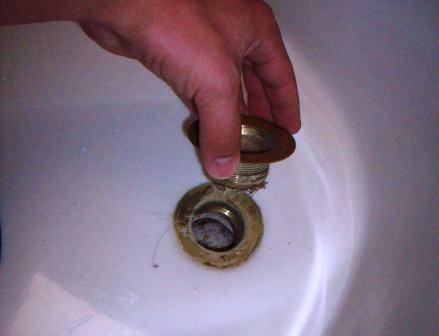 Next, the drain plug was removed. To do this, the plug was pushed down, and unscrewed. 5. To remove the base, slip joint pliers were placed between the cross, and a chisel was used to twist the pliers. There is also a tool available at Lowe’s and Home Depot that will grip the inside wall of the base, allowing you to twist it out. Carefully and slowly increase the amount of torque you are applying to the base. If you twist to hard or fast, you risk damaging the base, drain pipe, or your tools. 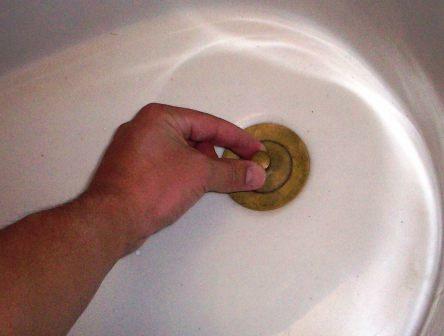 Plumbers putty or a rubber gasket should be underneath, preventing any rotation. But, it will unscrew slowly. 6. Now the overflow drain plate was removed by unscrewing the screws. 7. A new chrome drain plug and overflow plate was purchased. 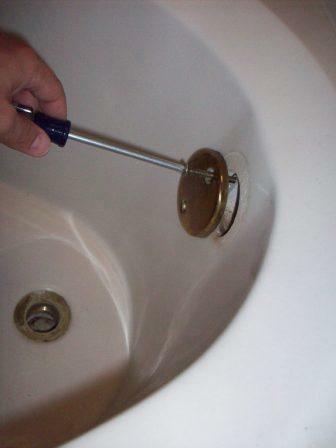 Depending on the age of your tub, your drain plug will most likely be a different size then what is available from Lowes and Home Depot. Our drain is 2 inches in diameter ( instead of 2.25”, I believe, available at Lowes and Home Depot) and so, I had to purchase it from a specialty plumbing store, for substantially more ($35 instead of the Lowes $10). 8. 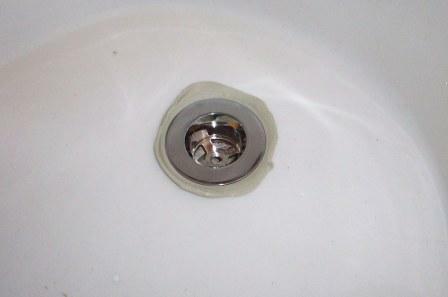 To reinstall the drain plug, a wad of plumbers putty (or rubber gasket) should be placed around the drain, and the plug screwed in the same way it was removed. The new overflow plate was also installed. 9. 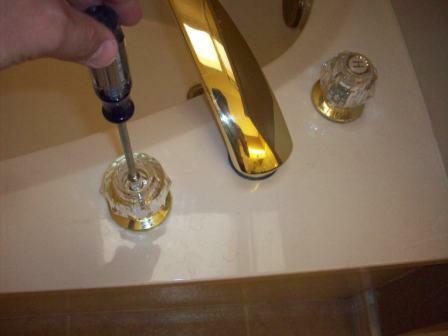 Once the parts came back from getting chromed, they were installed, following Moen’s instructions. New o-rings, grease, and “flow straightener” were purchased from Moen.com. 10. And, viola, a new chrome tub faucet for about $100. This entry was posted on November 2, 2008 at 5:04 pm	and is filed under Bathroom, Interior. Tagged: chrome bathroom, chrome fixtures, chrome tub faucet. You can follow any responses to this entry through the RSS 2.0 feed. You can leave a response, or trackback from your own site. My husband and I just went through the same problem. After much research we found your comments. My Delta faucet is now on its way to Elite to be chromed. What an ordeal. We thought it would be simple to change from Gold to Chrome. Turned out…… no way. We would have had to change the rough in which meant going through our tile surround. While trying to find a replacement I also started looking to chrome plate it. Glad I found your comments. It helped to know we aren’t the only ones in this boat and it also helped to locate someone to chrome it. Thanks for posting this. 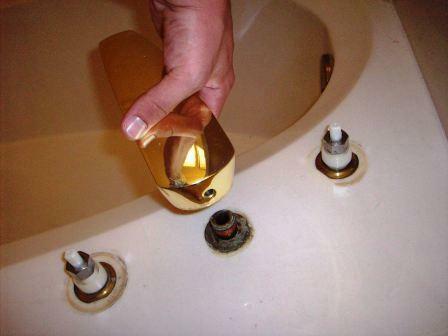 I am in process of removing my brass faucet and accent rings. Unfortunately, the home builder attached these with caulk instead of screwing them in. I think they installed the valve too low to the deck. Got the accent rings off but I’m still working on the faucet. Is there anything in there holding it to the valve besides the set screw? I’ve got it loose but it won’t budge. Figure I have some more caulk to loosen up. Whew, all this to get rid of that 80s brass! Thanks for the comment! Please let us know how it turned out! The set screw should be the only thing holding the faucet on. 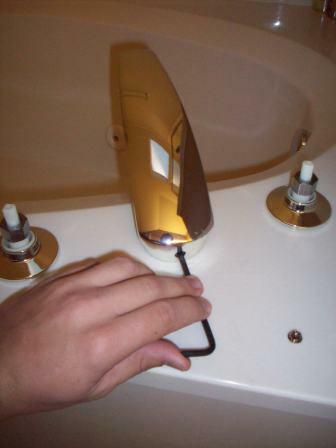 The o-ring inside of the faucet fits tightly over the incoming water line, which is sufficient to keep the faucet in place. 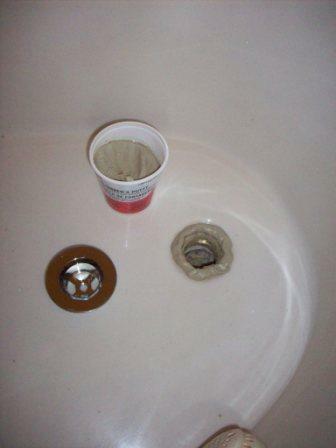 The builder shouldn’t have put caulk under the faucet, but, if he did, it will be very difficult to remove. Make sure the set screw is completely removed, and just pull directly straight up. DO NOT twist side to side, because there probably is a pin preventing the twisting motion. If you pull straight up, I am almost certain that you can’t damage anything, but, only if you pull straight up. So, son’t be shy. 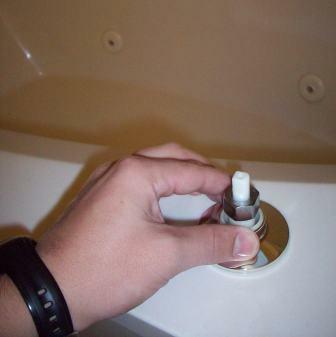 The caulk maybe preventing it from loosening as well, so, if you can, you may want to try to carefully slip a razorblade between the faucet and the tub. 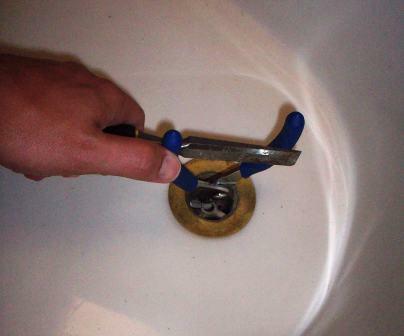 Hopefully, this will cut the caulk enough so that you can just pull the faucet right off. Hope this helps! How do you get the accent rings off? Mine won’t budge. Love this plan! Can you change the handles on this faucet to something more modern looking? 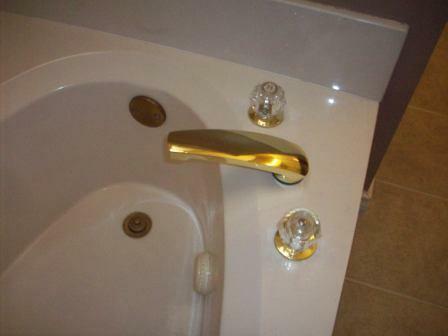 I have the same crome faucet for my tub but I think the handles are ugly. Lovely work, thanks for sharing! Chrome plating is a wonderful way to add life to home applicances like this, as well as helping to ressurect cars and bikes and industrial machines too. That’s funny! Now instead of looking like something from the late 80’s and 90’s, it looks like the 50’s and 60’s. Retro! Progress… ahhhh…. Wow! Thank you so much! ! I’m going to do this, this weekend.